The Achtiname of Muhammad, also known as the Covenant or (Holy) Testament (Testamentum) of Muhammad, is a medieval document which purports to be a charter or writ ratified by Muhammad granting protection and other privileges to the monks of Saint Catherine's Monastery on Mount Sinai. 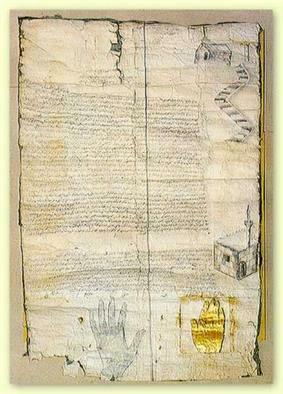 It is sealed with an imprint representing Muhammad's hand. Christianity and Islam share a historical and traditional connection, with some stark theological differences. The two faiths share a common origin in the Middle East and are often considered Abrahamic religions. Muslims have a range of views on Christianity, often considering Christians (and Jews) to be People of the Book or as heretics. Christian views on Islam are diverse and range from considering Islam a fellow related religion worshipping the same God, through to a heresy or unrelated cult. Christianity and Islam both consider Jesus to have been sent by God. However Christians generally consider Jesus to be the Son of God, while Muslims consider the Trinity a division of God's Oneness and a grave sin (Shirk). Both religions consider themselves monotheistic. Christianity and Islam have different scriptures, with Islam using the Quran and Christianity the Bible. Both texts offer an account of the life and works of Jesus. Belief in the Injil (the Islamic account of Jesus) is an important part of Islamic theology, and Muslims view the Christian Gospels as altered, while Christians consider the Quran to be a later, Apocryphal work. Both religions believe in the Virgin birth of Jesus, but the Biblical and Quranic accounts differ. Historically, Christianity and Islam have both peacefully co-existed and engaged in extended periods of warfare. Western (secular and Christian) and Islamic histories offer differing accounts of both periods of tolerance and violence. Christianity, Islam and Judaism are known as Abrahamic religions because of their common origin through Abraham. Christians and Muslims consider Ishmael (Ismā'īl), to be the "Father of the Arabs" and Isaac (Isḥāq) the "Father of the Hebrews". The story of Abraham and his sons is told in the Book of Genesis and the Qur'an but with certain differences, with Muslims emphasising Ishmael as the older son of Abraham, and Christians emphasising Isaac as the favourite son of Abraham. Muslims commonly refer to Christians and Jews as "People of the Book", people who follow the same general teachings in relation to the worship of the One God (Tawhid) as known by Abraham. Christians differ in their opinions on the nearness of the relationship, with some considering the relationship close while others consider it distant compared to that between Christianity and Judaism or effectively non-existent. "Lo! Those who believe (in that which is revealed unto thee, Muhammad), and those who are Jews, and Christians, and Sabaeans – whoever believeth in Allah and the Last Day and doeth right – surely their reward is with their Lord, and there shall no fear come upon them neither shall they grieve." "And thou wilt find the nearest of them in affection to those who believe (to be) those who say: Lo! We are Christians. That is because there are among them priests and monks, and because they are not proud. When they listen to that which hath been revealed unto the messengers, thou seest their eyes overflow with tears because of their recognition of the Truth. They say: Our Lord, we believe. Inscribe us as among the witnesses. Allah hath rewarded them for that their saying – Gardens underneath which rivers flow, wherein they will abide for ever. That is the reward of the good." A study published in 2014 showed that the common Abrahamic origin of Islam and Christianity may be a way to unite Christians and Muslims. As the study showed, Muslim and Christian believers who acknowledged their religions' common origins were more positive towards each other. The Qur'an contains many references to people and events in the Bible. Muslims believe that Jesus was given the Injil (Greek evangel, or Gospel) from the Abrahamic God and that that parts of these teachings were eventually lost or distorted to produce what is now the Hebrew Bible and the Christian New Testament. Christians generally believe that the Quran is a later work than the Bible and non-divine in origin. 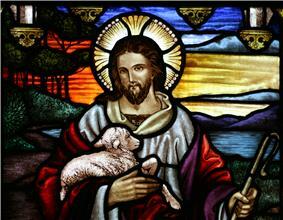 Islam teaches that Jesus (Isa) was one of the most important prophets of God and was a human being. 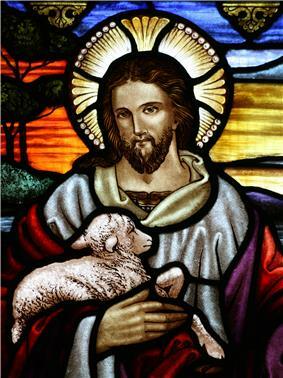 Muslims do not believe that he was the Son of God, nor that he is divine or part of a triune God as Christians believe. In Islam, Jesus was a human prophet who, like all the other prophets, tried to bring the children of Israel to the worship of One God. Muslims believe that Jesus was miraculously born of the Virgin Mary (Maryām). Muslims believe the creation of Jesus was similar to the creation of Adam (Adem) (the first prophet of God), they were both created by God without human fathers. It is said in John 14:2-3 and also in the Al-Quran 43:61 that Jesus will be sent again to earth at the end of time. He will fight against the Antichrist shortly before the Last Day. Both prophets have some similar teachings, e.g. Muhammad and Jesus Christ gave the lesson of monotheism which is mentioned in the book of Deuteronomy 6:4, in Mark 12:29 and in the Quran 112:1-4. Muslims contend that Jesus argues against division of God's oneness (shirk), along with references in the Exodus 20:2-5  and also in the Quran. In contrast, trinitarian Christian theology argues that New Testament, particularly the Gospel of John contains or is centred on the Trinity. Within Christianity, the doctrine of the Trinity states that God is a single being who exists, simultaneously and eternally, as a communion of three distinct persons, the Father, the Son and the Holy Spirit. Within Islam however, such a concept of plurality within God is a denial of monotheism, and foreign to the revelation found in Muslim scripture. The act of ascribing partners to God, whether they be sons, daughters, or other partners, is considered to be blasphemous in Islam. The Qur'an asserts God's absolute oneness, thus ruling out the possibility of another being sharing his sovereignty or nature. Islam teaches Muslims that Jesus was a messenger of God and that he did not claim to be God's son. The Holy Spirit is generally believed to be the angel Gabriel. Christians generally believe that Muhammad is not mentioned or alluded to in the Bible. As Jesus is considered the Son of God, a later revelation is either redundant or heretical. Some conservative Christians identify Muhammad with the False Prophet or Antichrist. Muslim preachers including Zakir Naik and Ahmad Deedat argue that the Paraclete referred to in the Gospel of John (according to several scholars written near the end of the 1st century AD) is a prophecy of the coming of Muhammad. "Nevertheless I tell you the truth: It is expedient for you that I go away; for if I go not away, the Comforter will not come unto you; but if I go, I will send him unto you." In the Gospel of John (14:16, 15:26, and 16:7) the word often translated into English as "Comforter" is the Greek word Paracletos, a word with several shades of meaning, including both "advocate" and "comforter". Many Muslim scholars believe that the Greek word Paraclete refers to Muhammad. Christians believe that the Paraclete who comes in place of Christ is the Holy Spirit, who was manifested on the day of Pentecost. In 746 John of Damascus (sometimes St. John of Damascus) wrote the Fount of Knowledge part two of which is entitled Heresies in Epitome: How They Began and Whence They Drew Their Origin. In this work St. John makes extensive reference to the Koran and, in St. Johns's opinion, its failure to live up to even the most basic scrutiny. 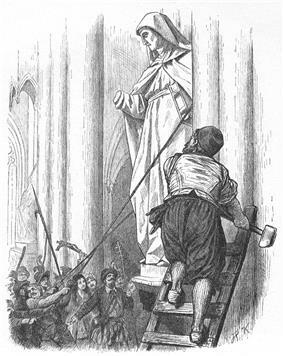 The work is not exclusively concerned with the Ismaelites (a name for the Muslims as they claimed to have descended from Ismael) but all heresy. The Fount of Knowledge references several suras directly often with apparent incredulity. Islam and Protestantism entered into contact during the 16th century, at a time when Protestant movements in northern Europe coincided with the expansion of the Ottoman Empire in southern Europe. As both were in conflict with the Catholic Holy Roman Empire, numerous exchanges occurred, exploring religious similarities and the possibility of trade and military alliances. Relations became more conflictual in the early modern and modern periods, although recent attempts have been made at rapprochement. In terms of comparative religion, there are also interesting similarities, as well as differences, such as textual criticism and iconoclasm in both religious approaches. ^ 'The time of origin is to be put around the turn of the century.' Theissen, Gerd and Annette Merz. The historical Jesus: a comprehensive guide. Fortress Press. 1998. translated from German (1996 edition). p. 36. ^ '[T]he Gospel circulated abroad during the first half of the 2nd century but was probably composed about 90–100 CE.' Harris, Stephen L., Understanding the Bible. Palo Alto: Mayfield. 1985. p. 303.